ServiceMaster by Wright was called on a Saturday at 10:30 pm to a single family home in Fort Myers, Florida that had a water damage caused by a leak under the kitchen sink. The water damage affected the entire home, three bedrooms, living room, dining room, hall, kitchen and two bathrooms. All of the rooms, except for the two bathrooms had parquet flooring over terrazzo and it was buckling up 5” – 6” and had to be removed. The walls were plaster and wet 2″ – 3″ up the wall in some areas. ServiceMaster extracted the water and started the drying out process. ServiceMaster set up dehumidifiers, air movers and injectidry equipment throughout the home. Cabinets in the home were damaged and needed to be removed and will be replaced during the reconstruct. 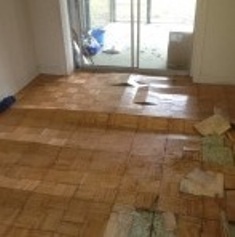 After ServiceMaster’s water remediation department is done, ServiceMaster’s construction department will start to rebuild the home back to its original state before the water damage occurred. ServiceMaster’s construction department will replace flooring, cabinets, paint, and baseboards. We are committed to provide quality water damage service to Southwest Florida, Collier, Lee, Manatee and Sarasota Counties businesses. Call ServiceMaster 866-676-7761 today!